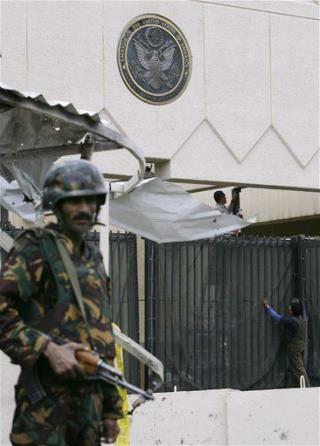 (Newser) – Yemeni security officials say a gunman has assassinated the Yemeni chief of security at the US Embassy in Sanaa. The officials say Qassem Aqlani, who was in his fifties, was shot dead while on his way to work early today. They say a gunman on a motorcycle opened fire at him and fled the scene. The Yemeni officials said the killing bore the hallmarks of an al-Qaeda attack, but it was too early to determine if the group was behind it. How is this tie into anything political? Yemen is a terrorist resort. hey..hey..don't you know it's bush's doing..